The answer this morning is, ‘I don’t care’, but by approximately 5 pm on Saturday that will change. This year has been an odd one for me, with more time off the bike (the great irony here is that my cycling tour business is the cause) and the World Cup taking my ‘fan time’ away from cycling. The Tour never fails to pull me back in, though, so I’m not worried. My pick for the Tour is this guy. I’ve got a soft spot for Alberto and his Spanish-beef induced love of incessant attacking. I agree. I would like to see Bertie win this year. Shoko calls him ‘Con-chan’…as you would expect. That makes sense, in a way that males sense only to the Japanese. I think it will be a very interesting tour this year. As much as Froome and Sky feel they have a stranglehold on the Tour, I think they’ve shown a chink in the armour. Stage 2’s nine cols and the cobblestones in northern France could produce some very interesting turns. 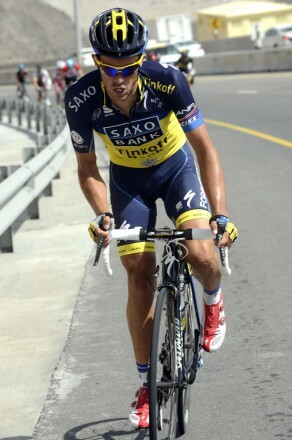 I think contador has a great chance. I was expecting to see Quintana win so I am disappointed that he will not be there. In many ways the sprint stages may well be the most interesting. Yes, the team decided long ago that Valverde was going to be the man for the Tour. Maybe next year? He certainly looked as though he could have won last year if he had had a little more experience. The World Cup has been loads of fun indeed (c.f., BEL-USA). Yet, this Saturday summer really starts: the Tour! The most beautiful TV sports coverage of the year: 2 hours of daily vacation in the prettiest country. For me, any winner is great as long as Cavendish does not wear the yellow jersey. The worse he does, the better the tour.